G.M. de la Escalera and R.I. Weiner, Analysis of Pulsatility in Immortalized GnRH Cell Lines. S. Wray, Use of Organotypic Cultures for the Study of Neuroendocrine Cells. M.J. Kelly and O.K. RØnnekleiv, Electrophysiological Analysis of Neuroendocrine Neuronal Activity in Hypothalamic Slices. S.S. Stojilkovic, L.Z. Krsmanovic, D.J. Spergel, M. Tomic,and K.J. Catt, Calcium Signaling and Episodic Secretory Responses of GnRH Neurons. A. Tse and B. Hille, Patch-Clamp Studies on Identified Pituitary Gonadotropes in Vitro. K.T. O'Byrne and E. Knobil, Electrophysiological Analysis of GnRH Pulse Generator Activity in the Rhesus Monkey. M. Nishihara, Y. Mori, M.-J. Yoo, and M. Takahashi, In Vivo Electrophysiological Monitoring of the GnRH Pulse Generator in Rats and Goats. J.E. Levine, A.M. Wolfe, T. Porkka-Heiskannen, J.M. Meredith, J.R. Norgle, and F.W. Turek, In Vivo Sampling and Administration of Hormone Pulses in Rodents. A. Caraty, A. Locatelli, S.M. Moenter, and F.J. Karsch, Sampling of Hypophyseal Portal Blood of Conscious Sheep for Direct Monitoring of Hypothalamic Neurosecretory Substances. E. Terasawa, in Vivo Measurement of Pulsatile Release of Neuropeptides and Neurotransmitters in Rhesus Monkeys Using Push-Pull Perfusion. C.J. Goodner, In VitroSystems for Modeling Target Tissue Responses to Secretory Pulses of the Islet Hormones: Glucagon and Insulin. S.M. Yellon and E.M. Apostolakis, Pulsatile Endocrine Secretion in the Ovine Fetus. M.S. Jasper, J.T. Walworth, and W.C. Engeland, Pulsatile Corticosterone Secretion as Measured by Intraadrenal Microdialysis. R.J. Urban, Comparative Analysis and Procedures for Validation of Pulse-Detection Algorithms. J.D. Veldhuis, J. Moorman, and M.L. Johnson, Deconvolution Analysis of Neuroendocrine Data: Waveform-Specific and Waveform-Independent Methods and Applications. G.R. Merriam and K.W. Wachter, Analysis of the Temporal Coincidence of Hormonal Pulses. J.D. Veldhuis, M.L. Johnson, L.M. Faunt, and E. Seneta, Assessing Temporal Coupling between Two or among Three or More Neuroendocrine Pulse Trains. K. Prank and G. Brabant, Estimating Thyrotropin Secretory Activity by a Deconvolution Procedure. J. Sturis, E. Mosekilde, and E. Van Cauter, Modeling Modulatory Effects on Pulsatility. R.P. Murray-McIntosh and J.E.A. McIntosh, Modeling Pulsatile Hormone Stimulation of Cell Responses. M.A. Shupnik, Pulsatile Neuropeptide Delivery and Analysis of Hormone Biosynthesis. J.F. Ackland, K.L. Knox, A.A. Elskus, P.C. Fallest, E.S. Hiatt, and N.B. Schwartz, Use of an in Vitro Perifusion System to Study the Effects of Pulsatile Hormone Administration on the Control of the Hypothalamic-Pituitary-Ovarian Axis. P.J. Lefebvre, G. Paolisso, and A.J. Scheen, Pulsatile Administration of Insulin and Glucagon in Man. Index. 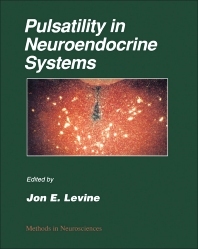 Pulsatility is now recognized as a nearly ubiquitous functional feature of neuroendocrine systems. This volume presents a comprehensive guide to the established and emerging technologies being used to study the perplexing phenomenon of pulsatility. Molecular, cellular, physiological, and mathematical approaches are described in detail. Neurophysiologists, neurochemists, neuropharmacologists, cell biologists, molecular biologists, endocrinologists, biochemists, biophysicists, neuroendocrinologists, and toxicologists.